Nakajima in hot pursuit of an errant Lancia. Tsujimoto Natsumi rescues a kitten, literally loses her lunch, and winds up with a ticket….all on her way to her first day of work as a police officer at the Bokuto station. She is partnered with speed freak Kobayakawa Miyuki, and together they do their best to make the roads of Tokyo a little safer for everyone else. The You’re Under Arrest! (逮捕しちゃうぞ, taiho shichauzo, 1994) OVA is the anime that started it all. It is based on a manga written by Fujishima Kousuke, who is more well known in America as the author of Oh! My Goddess! However, YUA! was actually Fujishima’s earlier work. In fact, Belldandy uses a recycled Miyuki character design. But I digress. This four-part OVA basically spans Natsumi’s first year as a traffic officer. The nature of being a miniseries already limits character development. Also dividing a year over four episodes inevitably leads to some serious pacing issues. However, the first episode was a good indicator of what to come in the following three, as well as the TV series that followed it: Absolute hilarity. When I saw the scene in which Miyuki handed Natsumi her ticket, I knew I had to be in for a good time as it still remains one of the funniest scenes I have ever seen in an anime. Another thing I noticed pretty quickly was the quality of the presentation. Furuhashi Kazuhiro directed the OVA as well as the first season of the TV series, after which he went on to direct Rurouni Kenshin. YUA! 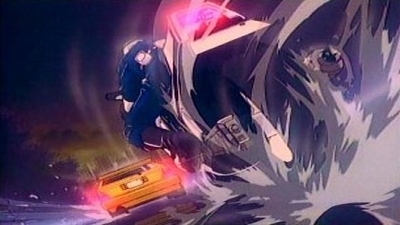 had lush visuals, and that was exemplified in the chase sequences, particularly in the one in part two. Furuhashi’s use of dynamic camera angles combined with the jazzy musical score served to create the single most exciting driving sequence I have ever seen. It also helped that the episode, which took place while a heavy storm was in Tokyo, had some of the best rain animation I have ever seen. Combine that with some of the best character designs in the business, and you have a real treat for the eyes. Fujishima’s manga often involve fast cars driven by beautiful women, and YUA! is no exception. Miyuki and Natsumi in this OVA easily had two of the most attractive designs I have seen in an anime. Besides the pacing, the only other issue I had with the OVA was that it got a little sappy toward the end. The last part dealt with the possibility of Natsumi leaving her partnership with Miyuki to join a motorcycle squad. Nonetheless, the OVA was a great watch, and segued into an even better television series. So obviously, I would strongly suggest dropping the dough for the entire first season of YUA!, which includes the OVA. I think it’s rather sad that the quality of the anime had declined as much as it did over the years. You’ll see what I mean if you didn’t read my review of Full Throttle.